On a trip to the West Coast recently I spent most of my driving hours listening to Marina Abramovic's memoir Walk Through Walls. In this case listening to the book was a good choice as I got to hear Marina read her memoir in her deep, rich Yugoslavian accent. It read like a meditation. Abramovic is a Yugoslavian-born performance artist who came of age in the 80's and 90's, Europe. She is most famous for her 3-month long-duration performance at the MoMa in New York City called The Artist is Present. Abramovic tells of her first authentic existential moment while reading a book of letters between Rainer Maria Rilke, Boris Pasternak and Marina Tsvetayeva entitled Letters Summer 1926. This book of correspondences inducted Abramovic not only into the realm of artist, but also, into the realm of seeker. The themes of artist and seeker play simultaneously throughout the book. Walk Through Walls shows Abramovic pushing boundaries to the extreme, involving her own body in the search for authentic creativity. Marina's journey was engaging from start to finish as we follow her out of Yugoslavia and evolve with her through each performance. Her artistic questions matured as her performances matured. She lived complexly, intensely, rightly, wrongly, awkwardly, painfully, joyfully, tragically, violently, and magically. She was wounded and healed over and over again. 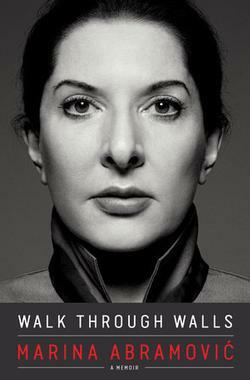 Abramovic came to pen a manifesto informed by her life's work and artistic experiences. She stressed the importance of solitude and to be away (even if for just a minute) from home, studio, family and friends-to listen to silence. An artist should stay for long periods of time at waterfalls. An artist should stay for long periods of time at exploding volcanoes. An artist should stay for long periods of time looking at fast-running rivers. An artist should stay for long periods of time looking at the horizon where the ocean and sky meet. When I returned from the West Coast, back to the desert, a rainstorm welcomed me. I recognized in that rainstorm one part of my own manifesto: to try and see what was directly in front of me with presence and with what Abramovic would call, tenderness. It made me think, also how a book can change one, however minutely. This memoir did just that.